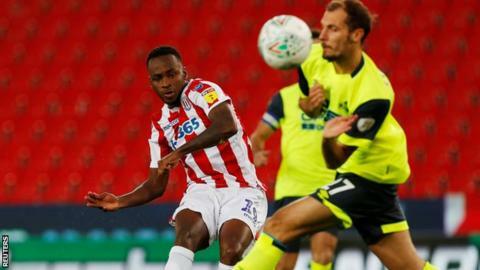 Saido Berahino ended his two-and-a-half-year goal drought as Stoke knocked Premier League Huddersfield Town out of the Carabao Cup in the second round. Huddersfield made 10 changes to the side that drew with Cardiff and their winless start to the season continued. Berahino, 25, got his first Stoke goal since joining for £12m in 2017, and his first at all for 913 days, as he headed in after James McClean hit the bar. Debutant Juninho Bacuna's bizarre own goal made it 2-0 deep in stoppage time. Bacuna, a summer signing from Dutch side FC Groningen, sliced an attempted volleyed clearance over goalkeeper Jonas Lossl from just inside his own half - at a time when the visitors were throwing players forward in an attempt to equalise. McClean had forced a good save from Lossl during a low-key opening 45 minutes, played in front of only 7,290 fans. The result gave Stoke a second straight win after victory over Hull in the Championship on Saturday and extended Huddersfield's winless run to eight games, going back to last season. But that streak pales in comparison to the goalless spell former West Bromwich Albion striker Berahino had endured, with his previous goal having come when he netted for the Baggies against Crystal Palace on 27 February 2016. "It's been a while," Berahino told BBC Radio 5 live. "It was a very special moment for me, especially how all the lads came over to celebrate in front of the home fans. It felt great. "I am really, really happy that it happened - now people can stop being on my back," he added. "It has been really tough for me, coming into a new team and not being able to show your qualities. Being relegated last year was really hard to take and I didn't really do much on the pitch to help the team. The team suffered a lot, and I suffered a lot too. "But I have been working hard in pre-season and wanted to make sure I would take my opportunity when it came. I had to block out all the negative thoughts in my head and what was surrounding me. I just made sure I stayed positive. "It's about pushing on now. I feel good, but obviously the most important thing for me was to get the win, and if the goal came then I will take that any day." Stoke boss Gary Rowett: "He [Berahino] needed a lucky break and he's reacted well. I'm pleased for everyone first and foremost, but I'm pleased for him. "He's only 25 and he's got a bright career. It's a good start for him and he's got to keep working hard. He's been one of our brighter players and his work rate has been excellent. "The first day I came in Saido came to see me and wanted to see where he stood and to discuss why previous regimes had maybe ostracised him, maybe? "He said he'd been to blame for some of his actions and he was honest, which is the first step for anyone who has done something wrong and wants to start afresh. "All I said to him was forget me - if you work hard for me then you'll win me over. I told him it's the rest of his mates he has to win over, he had to earn the respect of his team-mates back and for them to trust him. "When he scored everybody went over to him, which shows they were all really pleased for him. He's worked hard since pre-season and earned the respect of his team-mates." Former Burnley, Bolton and Blackburn manager Owen Coyle told BBC Radio 5 live: "It'll be a tremendous boost for him and he is young enough to get his career back on track and get to the level he was at before. "When you've been on a bad run, you are just desperate to get that ball over the line. From a striker's perspective, it makes a huge difference, to be in amongst the goals. "Berahino will now look a yard quicker. His body language will change and he'll be excited about the game." Own Goal by Juninho Bacuna, Huddersfield Town. Stoke City 2, Huddersfield Town 0. Attempt missed. Jonas Lössl (Huddersfield Town) header from the centre of the box is just a bit too high following a corner. Corner, Huddersfield Town. Conceded by Cuco Martina. Attempt missed. Laurent Depoitre (Huddersfield Town) header from the centre of the box is close, but misses to the left following a corner. Substitution, Stoke City. Charlie Adam replaces Saido Berahino. Attempt missed. Chris Löwe (Huddersfield Town) left footed shot from outside the box is just a bit too high from a direct free kick. Chris Löwe (Huddersfield Town) wins a free kick on the right wing. Attempt missed. Laurent Depoitre (Huddersfield Town) right footed shot from the centre of the box is just a bit too high following a corner. Substitution, Stoke City. Moritz Bauer replaces Erik Pieters. Substitution, Huddersfield Town. Chris Löwe replaces Erik Durm. Delay in match Bruno Martins Indi (Stoke City) because of an injury. Attempt blocked. Alex Pritchard (Huddersfield Town) left footed shot from outside the box is blocked. Attempt saved. Isaac Mbenza (Huddersfield Town) right footed shot from outside the box is saved in the bottom right corner. Corner, Huddersfield Town. Conceded by Erik Pieters. Tommy Smith (Huddersfield Town) wins a free kick on the left wing. Substitution, Huddersfield Town. Aaron Mooy replaces Danny Williams. Substitution, Stoke City. Bojan replaces Mame Biram Diouf.